Following its coverage of the 25th Chinese National Antarctic Research Expedition (CHINARE 25), SciencePoles caught up with Chinese Arctic and Antarctic Administration (CAA), to hear about the goals of the 26th CHINARE expedition and China's future polar research plans, including the construction of a new research ice breaker. As with its space programme, China continues to expand its activities in the Polar Regions, in particular in Antarctica. During the 2008-09 Antarctic season, the 25th Chinese National Antarctic Research Expedition (CHINARE 25) built and inaugurated it's third Antarctic scientific research station, Kunlun Station, at Dome Argus (Dome A), the culminating point of the East Antarctic Ice Sheet. With an average temperature of -56?C and an altitude of 4,093 metres, Dome A is one of the most remote and inhospitable locations on Earth; yet it is also one of the most promising for climate research and astronomy. According to Dr. Huigen Yang, Kunlun Station and the expansion of Chinese polar research infrastructure and logistics will continue to be a priority in decades to come as China strives to meet the expectations of an increasing number of its scientists who would like to work in the Polar Regions. This rising demand is driven by the Chinese scientific community's desire to play a key role in international climate and environmental research, as well as seize the unique possibilities the Poles offer to less obvious domains such as atmospheric physics and astronomy - one of the oldest and most traditional Chinese scientific disciplines. Following two days of public celebrations to mark the 20th anniversary of the Polar Research Institute of China, on the 11th of October, the 26th Chinese National Antarctic Research Expedition (CHINARE 26) set off from Shanghai onboard the Xue Long (Snow Dragon), barely six months after the ice breaker had returned from its previous Antarctic campaign. Onboard were 251 expedition members and crew, including a dozen women, and for the first time, a handful of Taiwanese scientists. Aerial surveying of the Prydz Bay region around Zhongshan Station using a new unmanned plane equipped with aerial cameras, radiometers, and probes. Named Xueyan (Snow Swallow), the robotic plane will survey an area of 1,600 kilometers and collect key data on icebergs and ocean-atmosphere interaction. Looking further afield, scientists will also be heading inland to collect meteorites in the blue ice fields of the Groves Mountain region, and will continue to set their sights on the lower and upper atmosphere, thanks to their participation in ongoing international research on auroras and the ionosphere in collaboration with Japan and other member nations of the SuperDARN observation network. For this, a new high tech observatory is in the process of being built at Zhongshan Station and should be completed this season. It will be equipped with a new HF Radar designed in collaboration with the University of Leicester in the UK, and will be part of network of 13 radars in the Arctic and 8 radars in Antarctica. Equipped with its own brand new Ka-32 heavy loads helicopter, the CHINARE 26 expedition will also have to continue the extension and renovation programme at both Great Wall Station on King Georges Island (which will receive new fuel tanks), and at Zhongshan Station in the Larseman Hills of East Antarctica, which will inaugurate both new living and sleeping quarters along with new technical facilities. For the second consecutive year, the Dome A traverse team of 20 men will be lead by glaciologist Li Yuansheng, who oversaw the first phase of construction and the inauguration Kunlun Station last year. This puts him in a good place to oversee the 2nd phase of the construction, which will include installation of the interior fittings and the energy infrastructure. Li Yuansheng will also oversee the preparation of the Dome A site for future deep ice core drilling, with Chinese paleoclimatologists hoping to eventually retrieve a multi-kilometre ice core containing in excess of one million years of climate history. 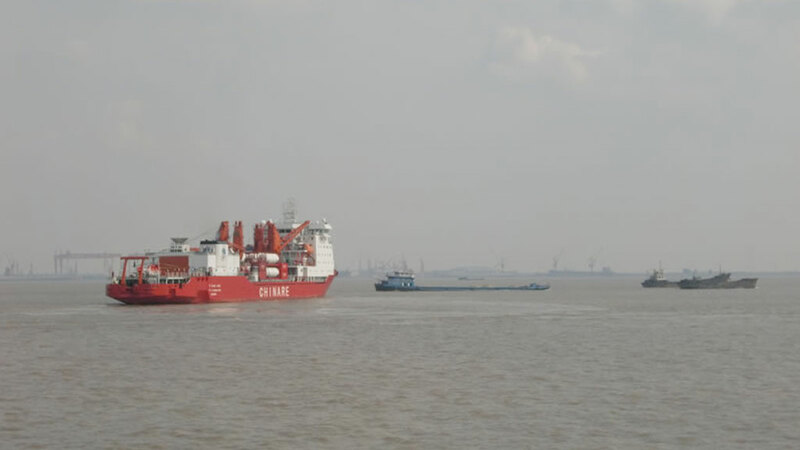 Finally, as is the case every year, CHINARE 26 will also be relieving the overwintering teams of scientists and logistics personnel from both Zhongshan and Great Wall Stations before sailing back to Shanghai in April 2010. With its sights firmly set on the long-term, China has also just announced the government approval and construction of a new research ice breaker, which coincides with the departure of CHINARE 26. According to Mr. Wei Wenliang, Vice-Director of the Chinese Arctic and Antarctic Administration (CAA), this represents the realization of a ten-year dream of the Chinese polar research programme. Smaller yet more powerful than the Xue Long - which can only break ice up to 1.5 meters thick - this vessel will have an ice-breaking capacity of up to four metres and will be dedicated solely to oceanographic research and data gathering. To be built in China within the context of China's 12th Five Year Economic Plan, it will be designed in collaboration with technical partners from Scandinavian countries and Russia - all Arctic nations specialized in the construction, navigation, and maintenance of this type of vessel. Once the new ice breaker has been launched, the Xue Long will no longer be used as a scientific platform. Instead, it will continue to operate as a logistics vessel for the transport of goods and materials over the remaining ten to fifteen years of its operational life. In addition to ocean logistics, China is also looking to expand its helicopter fleet in Antarctica and, as rapidly as possible, develop both intercontinental and continental air transportation systems to help carry scientists more rapidly from Australia to Antarctica as well as inland to Dome A. In addition to new Infrastructure in the Polar Regions, PRIC and CAA are also planning important infrastructure improvements for CHINARE's home port of Shanghai, with the design of a new domestic base, which will include a new pier, a research campus, an international data centre, and a storage facility for ice cores and other research samples. In order to facilitate this plan, and to mark its 20th anniversary, PRIC (to be renamed the Chinese Polar Research Center), is already increasing its staff from 145 to 230 employees this year. Finally, with the Xue Long back in Shanghai from its Antarctic campaign in April 2010, the Polar Research Institute of China will deploy the vessel to the Arctic during the boreal (northern hemisphere) summer of 2010. On this expedition, the Xue Long will carry not only a new wave of Chinese scientists working on the rapidly evolving environment of the Arctic Ocean, but also foreign scientists, including possibly researchers from the European Union working on the catastrophic retreat of Arctic sea ice. China has just announced the government approval and construction of a new research ice breaker.